Tom Mchale gets new Ruger Precision Rifle which means it is time for a short class on how to zero a scope and new rifle for long range shooting. Step one after taking this Ruger Precision Rifle out of the box is zeroing the scope. USA –-(Ammoland.com)- If you’re going to shoot long range, you need to make sure your zero is perfect. Small errors at 100 yards become big ones at 1,000 yards, so if your zero is off by just ½-inch at the 100-yard mark, you’re talking five full inches down range. We’re going to take a close look at the Ruger Precision Rifle in this long range shooting series of articles, so today we’ll take it to the range for its first outing to get a proper zero. There are lots of ways on how to zero a scope and rifle; this is just the method I prefer. It’ll take more than a couple of shots, but you’ll be confident you’re dead on when you stretch out the distance of your shots. While we won’t go through the process of mounting a scope here, it’s important to mention one important part of the process—ensuring that your scope is level with your rifle. The vertical crosshair must be perfectly aligned with the vertical centerline of your firearm. At closer ranges, a less than vertical crosshair won’t matter all that much. However, at longer ranges, a slight misalignment will cause a lateral miss. For example, a single degree of scope cant error can shift your point of impact by five inches at 1,000 yards. You can check the level of your crosshairs by making sure your rifle is perfectly level and then lining up the vertical crosshair with an object that you know is dead on vertical. Or you can use a tool like the Scope Setter. If you’re going to do most of your shooting at less than a couple hundred yards, or perhaps you only care about shorter-range minute of beast hunting accuracy, then quick and dirty methods like the “one-shot zero” and similar methods are fine. How to Zero a Scope: This particular scope uses target turrets that move the point of impact 1/4″ (1/4 MOA) at 100 yards. However, tiny errors at 100 or 200 yards become big ones at 1,000 yards, so it’s important to use a more methodical process. Don’t rely on single-shot indicators to determine your zero status. I like to use three-shot groups at each step along the way, except for the initial “get on paper” shot at 25 yards. Using three shot groups allows you to find a decent average impact point given the mechanical variability in your scope, rifle, and ammunition combination. It also helps factor out shooter error. If three shots land in the same area, you can be fairly confident that both you and your equipment agree. 87% of people learning how to zero scopes at the range use trial and error to zero their optics. You’ve seen it. Fire a shot. Look at the target. Spin the turrets one way. Fire again. Spin them the other way. 25 shots later, they’re still chasing the perfect settings. I'm going to be testing this Ruger Precision Rifle with Hornady 140-grain Match ELD, so I zeroed it with the same. Here’s what it means. When shooting at 100 yards, each click will move the bullet impact ¼-inch in the direction indicated. Scope measurements like minutes of angle (MOA) and mils (milliradians) are proportional, so if you’re shooting at half the distance, each click will move the point of impact half as much. At 50 yards, that click will move the point of impact by one-half of one-quarter of an inch, or 1/8th of an inch. At 25 yards, it would be one-fourth of one-quarter of an inch or 1/16th of an inch. It works the other way too. If you’re shooting at 200 yards, just double the adjustment impact. One click will move the bullet hole two times a quarter of an inch, or ½-inch. Make sense? Some scope turrets are marked in milliradians, most commonly “1 click – .1 mils.” A “mil” represents 3.6 inches at 100 yards, so .1 mils is .36 (about 1/3) of an inch at that distance. At 50 yards, it’s ½ times .36 inches and so on. So, when adjusting, you can quickly determine how many clicks are required to get your rifle, in this case the Ruger Precision Rifle on target by looking at how many inches “off” you are. Hold this thought for a hot second and we’ll come back to it as we continue the process below. After mounting a new scope, you really have no idea where the first shot will go. Rather than putting a target far down range and hoping for the best, move your first target up close to 25 yards. You will almost certainly hit the paper somewhere before you make any scope adjustments. Note the first 25-yard shot landed four inches high. After 64 clicks down, the next two were right on the bullseye. Time to move to 100 yards. Using the math described previously, you can make some rough adjustments to get close to the bullseye at this close range. Let’s walk through the process with a brand-new Ruger Precision Rifle chambered in 6.5mm Creedmoor. Heads up—one of you will own this rifle when it’s given away later at the end of this long-range shooting article series, so keep an eye out on this monthly newsletter! I mounted a Burris Veracity 4-20×50 scope I had handy on the rifle for the first range outing. This optic has target turrets that adjust in ¼ MOA increments per click, so when shooting at 100 yards, each click moves the point of impact ¼-inch. I fired my first shot at the target from 25 yards to get on paper and the bullet was dead center laterally but almost exactly four inches above the bullseye. Hey! Easy math! To move impact down four inches at 25 yards, I calculated 64 clicks “down” per the direction indicator on the turret. Since each click moves the impact ¼ inch at 100 yards, then that would be 16 clicks—if we were shooting at 100 yards. However, since we’re shooting at 25 yards or one-quarter of the distance, each click has 1/4th the amount of movement at 25, so we have to multiply our clicks by four. I counted off 64 clicks “down” and fired two more shots at the 25-target. Those impacts were right on the bullseye and went into the same hole. Yay Ruger Precision Rifle! Now that I was safely on paper and pretty darn close, I moved the target out to 100 yards and fired a three-shot group. As a quick side note, check the photo on that. All three bullets went into the same hole about 1½ inches low and 1/2-inch left. Three shots don’t make an accuracy test, but I was impressed. Acording to my Lyman Dial Caliper that group measured 0.076 inches. Yes, less than 1/10th of an inch. Anyway, doing the math again, I adjusted 6 clicks “up” and 3 clicks “right” to compensate, then fired another three-shot group. That group landed dead center in the bullseye and measured an astounding 0.046 inches. After moving the target to 100 yards, I fired a three shot group for final tuning. All three bullets went into the same hole and it was 1 1/2″ low and about 1/2″ to the left, so I adjusted again. 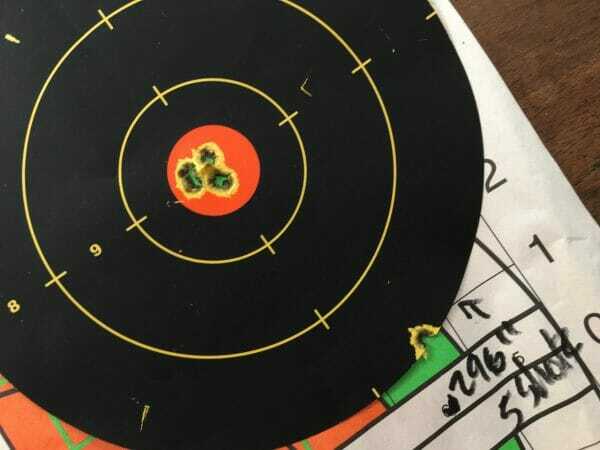 Seeing how closely the three shot groups landed, I fired a quick five-shot group and measured a 0.296-inch center-to-center pattern. I’m really looking forward to evaluating this rifle—it’s a tack driver. The confirmation group at 100 yards shows that this rifle is now properly zeroed. I zeroed this scope and rifle at 100 yards for convenience, not because 100 yards is the best all-around solution. Depending on caliber, optics, and intended use, it may make sense to zero your rifle at 50, 100, 200, or even 300, but that’s a topic for another day. After seeing some pretty unbelievable three shot groups, I fired five and got this .296″ group at 100 yards. This is one seriously accurate rifle. I didn’t include a final step, long-range confirmation, in this how to zero a scope article, because that’s a separate topic. Initially, we wanted to ensure that the rifle and scope were correctly aligned and you can do that at any reasonable short-range distance like 50, 100, or 200 yards. 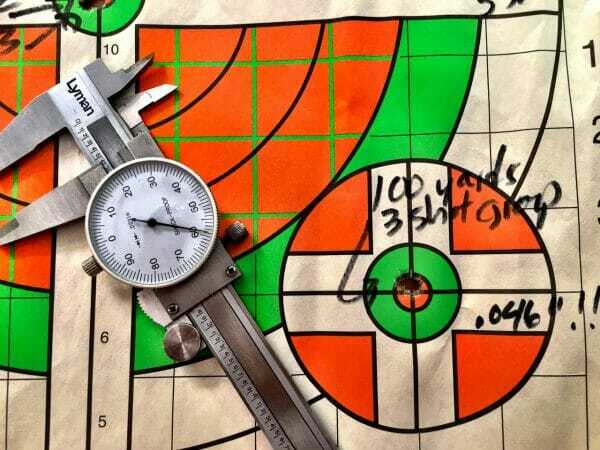 Before launching long-range shots that count, you’ll need to complete a second verification process to figure out which specific scope adjustments are required for different distances down range. That’s not really a scope “zeroing” issue as much as one of calibrating scope adjustments and bullet velocity, so we’ll cover it later in the series. Stay tuned! Excellent article! Look forward to more. Great info. What height are the rings? I have an 8-32×56 stightron and it will be moving from my 6.5 Ruger predator to the Gen III Ruger Precision. Zeroing can be easier. Method: Dial the cross-hair to your POI. We just zeroed a Tikka T3 in .308 Win. Rifle was placed on secure front rest and rear bag. 1. One shot at 50 yards to confirm on paper and within size of grid target. 3. With gun secured, and center of reticle starting right on center of target, you dial the crosshairs to the location of 100-yard bullet hole one. In our case this was down about 6 inches and left about 4 inches. 3. Second shot. This ended about 1″ from shot one, above and a bit left. 4. Third shot was same elevation as shot two, but centered. So we dialed down one MOA. 5. Fourth shot impacted nearly touching shot #1. We then waited for barrel to cool and made confirming shots off a backpack, as would be done in the field (this was a hunting rifle). We took two shots. Both impacted within 1/2″ of aim point, so we were done. Zeroed within limits of rifle’s accuracy. The whole process required six rounds and took about 20 minutes. The actual shooting took about 10 minutes. Re Group Size: I don’t know how Tom McHale measures groups. Perhaps his calipers weren’t adjusted properly. I measured that first group, listed as .076″, with On-Target software, I measured the first group as a 0.185″, using the markings on the caliper to set the scale. Honestly, when you can see three distinct circles like that, it is never a “zero group”. You can’t accurately measure a group from a photo, calibration or not. Lens distortion and the fact that the caliper dial is much closer to the lens than the paper completely throws off your distances. I measure close groups like this by outer edge to outer edge, then subtract the diameter of the bullet to get a center to center measurement. I’ll stand my my actual measurement before relying on measurement of a photo image. McHale’s method is incorrect. The reason is the bullet hole in paper is normally smaller than the nominal bullet diameter. That is why special optical reticles are using when scoring in matches. You center the bullet hole inside the measured circle. That is how the On-Target software works. I score targets for rimfire and centerfire benchrest matches. I’ve seen and scored true zero groups. The claimed 0.076 is not one. Another method is to measure ONE bullet hole as it appears on the paper of your target. Then subtract that number from outside edge to outside edges. Personally, I use Stanley Workmate (TM) that gets bolted to a concrete pad at 200 Yards, fitted with felt lined jaws to protect the rifle. Use the machine’s adjustments to get on the paper then dial the scope in to meet the POI. I own a RPR chambered in 6.5 Creedmoor and after taking my time to get my setup right, I can get sub 0.230 groupings at 200 yards. (Prone, off the bi-pod.) Given the RPR’s capability for long range accuracy, I’ve been tempted to stretch the range out to 500 yards (Easy to do in a field, just moving a bale and the target stand) and see what I can get. Good article. Everyone is so up on the 6.5…do you have any sighting info for the RPR in .308 Win? All good info but I don’t understand how, “I didn’t include a final step, long-range confirmation, in this how to zero a scope article, because that’s a separate topic” is a separate topic from an article entitled “How to Zero a Scope and Rifle for Long Range Shooting”. If that’s true, you could have stopped at the 25yd range. Great article! I recently got a Kel-Tec RFB and put a Leatherwood CMR-4 on it. It’s my first “long” gun, and my first time using an optic, and actually just went to the range with it 2 days before this article was posted. Spent an embarrassing amount of time turning the knobs back and forth and pulling the paper forward and seeing little change. Finally after about 20 shots, I payed attention to the text around the edge of the top turret: ‘1 click = .36″ @ 100 yds.’ pulled the paper forward, too a measurement, did some math (I also guessed to divide by 4, since my local range only goes out to 25 yds), and made one more adjustment and got a bullseye. Would have been nice to have read something like this first! It had beena few weeks since I skimmed the manual and didn’t bring it or my phone. Anyway, looking forward to the next article, because I’m heading out to the country to shoot at up to 300 yds soon. Great article, with helpful information for all. Also good info in comments as well. As my dad used to say, ” Do it right the first time son, so you don’t have to like your calf over”. I found a very quick and dirty way to get on target within 3 shots and here it is. 1. Get a very steady rifle rest like a Lead Sled. Place it on the bench and secure it so it won’t move. 2. Take your target out to 25 yards. Use an easy to see the target, like an orange center target. Easier to see the holes. One with inch lines won’t hurt the cause either. 3. Making sure the rest is as secure as possible. Then be sure the rest is adjusted so the crosshairs of the scope are centered. An adjustable rest works best for this. If you can secure the rifle tight to the rest so much the better. 4. Fire your first shot. 6. This is the most important part. While making sure neither the rife or rest move, adjust the crosshairs on the scope so they center on the hole of the first shot. 7. If the rifle shoots to the same place you are done for 25 yards. Take note of how many clicks it took. 8. You may want to fire the third round to be sure, that all three holes (hopefully only one) all hit in the same place you are good to go. 9. It is critical you do not move the rest or rifle while adjusting the scope. 10 From there on you can do the same for longer distances as long as you can see the holes thru the scope. It works very well for me and allows me to do more than one rifle in an afternoon, using fewer rounds. Try it once and see if this is not easier then the method shown above. NOTE best for 100 yards or less. For longer distances, you will want to his method after you sight in a shorter distance. That’s the best way to achieve mechanical zero (MZ) next you need to put the rifle in the actual shooting position you and with the actual ammunition you will use at the effective range of you’re ammunition. If you’re POI is the same that’s great. It’s likely you will need to make some adjustments. It’s the same issue with shooting from a bench rest on a hard table, or from a prone soft rest or from Just the sling. The biggest difference on a hard bench the rifle will bounce. From the soft rest or sling it won’t.Also you have to zero for the intended use of the rifle such as , target, compition, police tactical, military sniper. These are all different. They all require different zeroes. Example, I zeroed my 40A1 as a Marine scout sniper at 450 yards so all I would need to do is hold over of under to score a hit in combat that would take the target out of action. If a more precise hit was needed that was what the windage and elevation drums are for. Police sniper rifes are zeroed usually for 100 yds any different distance is adjusted for as needed. Both military and police have a spoter to feed corrections to the shooter. To sum up the hard sled will only produce the MZ. This method is normally used in both military and police sniper rifles then the shooter takes it from there. An excellent Scope for Fast target selection at unknown range (reasonably priced ) is the Shepherd / Salvo scope 2016 DRS 3×10 P1A $799.00 $599.00. The Only 100% made in USA scope and the only one to grind there own glass. Check out at>>> https://shepherdscopes.com/product/2016-drs-3×10-p1a/ which is the easiest scope to zero. Biggest scope manufacture in the world made especially for your ammo. These scopes are made by a company that makes both military and industrial optical equipment. Defense customers also > https://salvodefense.com/ I own 2 of these scopes and find that the technology is far beyond all existing scopes. I prefer 100 yard starting zero. Helps to bore sight with my bore laser calibrated to a gun already sighted in. Laser sights can show variance as they are turned in the bore. Use a sighted in gun, turn the laser until it lines up and mark it with a marker. Now your ready for initial sight in. After 100 yards I go to 300 yards and recalibrate on a windless day. This was a very interesting and Informative article. I cannot wait to read the rest of the seriesyou will have coming. The photos and explanations go a long way in assisting me thanks. I sights on my .308 at 100 yds, adjusted elevation to hit 34″ high. Then at 1000 yds, I was on target. I was very proud of that shot. Nice and straightforward episode, Tom. Looking forward to the series. I have an RPR in 6.5 Creedmoor, with a 5×20 FFP Vortex in MOA reticle. Both still waiting on me to find the range time. This will be interesting. I cannot claim to be a precision long range rifle shot. My range only has 100 yard rifle and 200 yard if they close another range. However, I’ve had good luck using a boresight laser, which I have readily available. You can get virtually a one shot zero by putting the boresight laser in, and dialing the scope cross hairs onto the laser spot at your sighting distance. Might take a click or two to get perfect zero (given laser divergence, and spot size), but it is a quick way to be in close before a round goes down range. Didn’t see any mention of monitoring wind esp on 100+ shots, but it is fairly obvious that trying to zero on gusting wind days, or high wind days can be an exercise in frustration. Again, appreciate your article. For my advice, your mileage may vary….happy shooting! Download 30 and 50 yard adjustable zero targets. If you don’t have access to 100yd range, you can get that zero. Google adjusted zero target, for ar and ak platform and others. That would be great! Any idea when we can expect that article? Army in 1980 when they still had the od green work uniform, and six weeks basic we qualified with targets from 10 to 300 yrds, and out to 600 on the m60 with me as his spotter my brother as in blood brother we went in together, cud hit a pop up Target with the m60 by making it fire one round at a time at 600 yards, once I walked him in on target with about 3 shots he would hit it Everytime DI,s we’re amazed with his open sight abilities, an by the way he had perfect score qualifying with m16 and got letter of commendation from Fort Dix post Camander and dinner with him also, best I ever saw with any type pistol, rifle, shotgun, and I sure miss him! Very Nice, would you recommend that specific Burris scope for this rifle? There will be another scope thrown into the mix as we work with this rifle and it will be given away at the end along with this rifle. Not sure which scope that will be yet, but stay tuned! FYI,,,there is NOT less wobble,,,just less detectable wobble. I sight either of my Rugers (6.5 & 6.0mm Creedmoore) at 25 yards by securing the rifle to a stand and aiming at the bull and taking the first shot and then with the rifle still secured and pointing at the original bull, turn the scope adjustment(s) so that the cross hair(s) are on the bullet hole, and then re-aim the rifle at the bull again after loosening the secured rifle and then take your second shot at the bull with your new scope settings and you should see the second hole exactly in the center of the bull if you have maintained the rifle position exactly where you took the first shot from. Two shots at 25 yards and then you can go to 50, 100, 200, 500, 1000 yards and readjust your scope accordingly. on the 5 shot target was one a flyer? it looks like only 4 went in the bull and you have one at about 5 30 at the bottom of the target but no mention of it. its pretty impressive grouping but just curious about the flyer. Based on my observations and and Mark 3 eyes I would say all five enter the bull, and the shooter was reusing a target. No, sorry for the confusion. The hole on the left is three shots with the other two to the right. All five were in the Orange. The target sticker was placed elsewhere at the range and that bottom hole is from unrelated shooting. The black target is just laying on top of the paper one for the photo. Uggh, my right / left confusion reigns again.. As Marvin says correctly the three holes are on the RIGHT and two on the LEFT. Surprised there was no mention of verifying “mechanical zero” of the scope itself prior to even starting the sight in process. May not be needed with brand new scope but you never know. Turn the windage adjustment all the way till it stops, then count the number of full and partial turns till it stops going the other direction. Divide by 2 and dial that value on the knob/turret. Repeat for the elevation knob/turret. This should give you “mechanical zero” ie reticle zeroed at the halfway point for windage and elevation within the scope tube. Was always told years ago by the old timer/experts this would help for a speedy zero and show possible misalignment of rings/bases from poor drill and tapping of the receiver. FWIW, it has always worked for me. How do you use a protractor to level your scope?